India. Andhrabhrityas. Potin 1/2 Karshapana. late 2nd century AD. 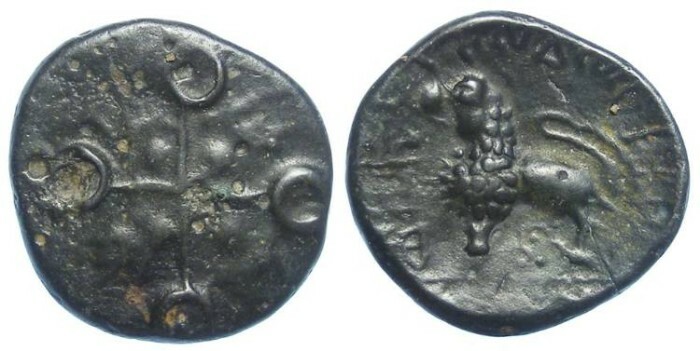 Denomination : Potin 1/2 Karshapana (40 Rattis). Mitchiner says these are lead, but this example is clearly bronze of either a high lead or high tin (potin) content (his image appears to have the same glossy patina inconsistent with lead). Size : 18.0 x 19.3 mm. Weight : 3.06 grams. Reference : Mitchiner Ancient 4979 variety. Obverse : Lion standing left, with symbols to the left.